I believe so. … Don't accuse anybody else. A good picture should be equivalent to a good deed. I am no friend of present-day Christianity, though its founder was sublime. It is a pity that, as one gradually gains experience, one loses one's youth. Though I am often in the depths of misery, there is still calmness, pure harmony and music inside me. 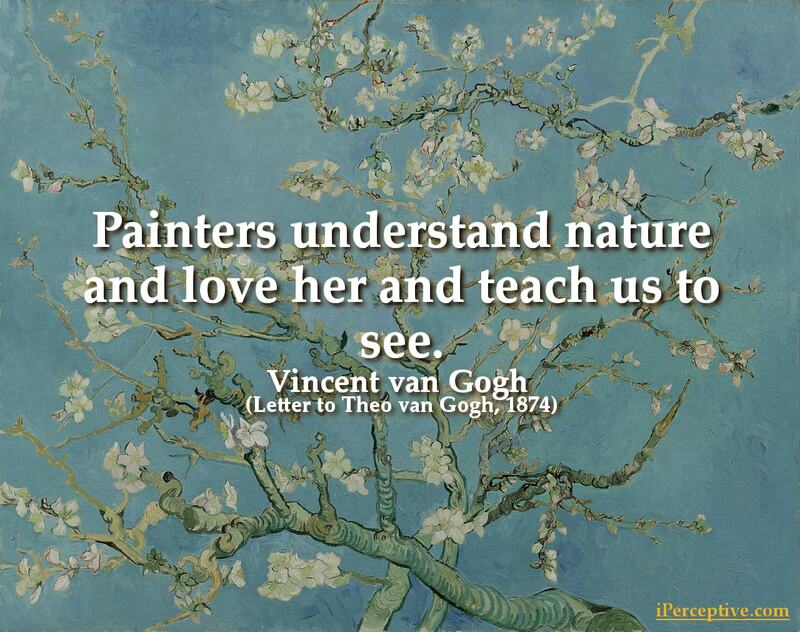 Painters understand nature and love her and teach us to see. I cannot help thinking that the best way of knowing God is to love many things. Love this friend, this person, this thing, whatever you like, and you will be on the right road to understanding Him better. Keep going, keep going come what may. But what is your final goal, you may ask. That goal will become clearer, will emerge slowly but surely, much as the draft turns into the sketch and the sketch into the painting through the serious work done on it, through the elaboration of the original vague idea and through the consolidation of the first fleeting and passing thought. People are often unable to do anything, imprisoned as they are in I don't know what kind of terrible, terrible, oh such terrible cage. It is better to be high-spirited, even though one makes more mistakes, than to be narrow-minded and all too prudent. It is good to love many things, for therein lies the true strength, and whosoever loves much performs much, and can accomplish much, and what is done in love, is well done. Life itself, too, is forever turning an infinitely vacant, dispiriting blank side towards man on which nothing appears, any more than it does on a blank canvas. But no matter how vacant and vain, how dead life may appear to be, the man of faith, of energy, of warmth, who knows something, will not be put off so easily. If ... boyhood and youth are but vanity, must it not be our ambition to become men? That God of the clergymen, He is for me as dead as a doornail. But am I an atheist for all that? The clergymen consider me as such — be it so; but I love, and how could I feel love if I did not live, and if others did not live, and then, if we live, there is something mysterious in that. Now call that God, or human nature or whatever you like, but there is something which I cannot define systematically, though it is very much alive and very real, and see, that is God, or as good as God. To believe in God for me is to feel that there is a God, not a dead one, or a stuffed one, but a living one, who with irresistible force urges us toward aimer encore; that is my opinion. 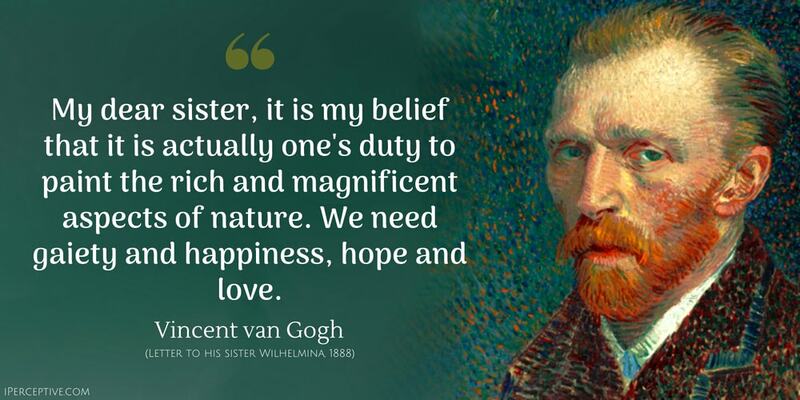 My dear sister, it is my belief that it is actually one's duty to paint the rich and magnificent aspects of nature. We need gaiety and happiness, hope and love. So please don't think that I am renouncing anything, I am reasonably faithful in my unfaithfulness and though I have changed, I am the same, and what preys on my mind is simply this one question: what am I good for, could I not be of service or use in some way, how can I become more knowledgeable and study some subject or other in depth? What am I in the eyes of most people — a nonentity, an eccentric, or an unpleasant person — somebody who has no position in society and will never have; in short, the lowest of the low. All right, then — even if that were absolutely true, then I should one day like to show by my work what such an eccentric, such a nobody, has in his heart. Some good must come by clinging to the right. 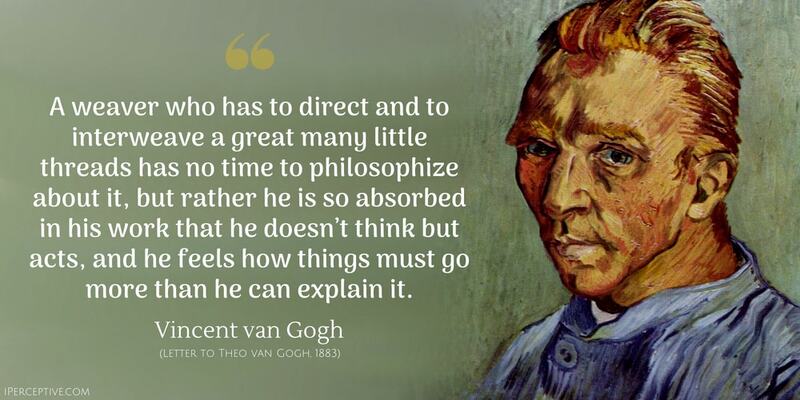 Conscience is a man's compass, and though the needle sometimes deviates, though one often perceives irregularities in directing one's course by it, still one must try to follow its direction. A weaver who has to direct and to interweave a great many little threads has no time to philosophize about it, but rather he is so absorbed in his work that he doesn’t think but acts, and he feels how things must go more than he can explain it. At present I absolutely want to paint a starry sky. It often seems to me that night is still more richly coloured than the day; having hues of the most intense violets, blues and greens. If only you pay attention to it you will see that certain stars are lemon-yellow, others pink or a green, blue and forget-me-not brilliance. And without my expatiating on this theme it is obvious that putting little white dots on the blue-black is not enough to paint a starry sky. One of the reasons why I have no regular job, and why I have not had a regular job for years, is quite simply that my ideas differ from those of the gentlemen who hand out the jobs to individuals who think as they do. It is not just a question of my appearance, which is what they have sanctimoniously reproached me with. It goes deeper, I do assure you. When we are working at a difficult task and strive after a good thing, we are fighting a righteous battle, the direct reward of which is that we are kept from much evil. As we advance in life it becomes more and more difficult, but in fighting the difficulties the inmost strength of the heart is developed. The thing has already taken form in my mind before I start it. The first attempts are absolutely unbearable. I say this because I want you to know that if you see something worthwhile in what I am doing, it is not by accident but because of real direction and purpose. One must learn to read, just as one must learn to see and learn to live. There are things which we feel to be good and true, though in the cold light of reason and calculation many things remain incomprehensible and dark. Well, right now it seems that things are going very badly for me, have been doing so for some considerable time, and may continue to do so well into the future. But it is possible that everything will get better after it has all seemed to go wrong. I am not counting on it, it may never happen, but if there should be a change for the better I should regard that as a gain, I should rejoice, I should say, at last! So there was something after all! What is true is that I have at times earned my own crust of bread, and at other times a friend has given it to me out of the goodness of his heart. I have lived whatever way I could, for better or for worse, taking things just as they came. One does not always know what one can do, but one nevertheless instinctively feels, I am good for something! My existence is not without reason! If one wants to be active, one must not be afraid of going wrong, one must not be afraid of making mistakes now and then. Many people think that they will become good just by doing no harm - but that's a lie.... That way lies stagnation, mediocrity. Love is eternal - the aspect may change, but not the essence. There is the same difference in a person before and after he is in love as there is in an unlighted lamp and one that is burning. The lamp was there and was a good lamp, but now it is shedding light too, and that is its real function. And love makes one calmer about many things, and that way, one is more fit for one's work. Variant: The more I think about it, the more I realize there is nothing more artistic than to love others. I must continue to follow the path I take now. If I do nothing, if I study nothing, if I cease searching, then, woe is me, I am lost. That is how I look at it — keep going, keep going come what may. But what is your final goal, you may ask. That goal will become clearer, will emerge slowly but surely, much as the rough draught turns into a sketch, and the sketch into a painting through the serious work done on it, through the elaboration of the original vague idea and through the consolidation of the first fleeting and passing thought. People are often unable to do anything, imprisoned as they are in I don't know what kind of terrible, terrible, oh such terrible cage... Do you know what makes the prison disappear? Every deep, genuine affection. Being friends, being brothers, loving, that is what opens the prison, with supreme power, by some magic force. Without these one stays dead. But whenever affection is revived, there life revives. It is not the language of painters but the language of nature which one should listen to.... The feeling for the things themselves, for reality, is more important than the feeling for pictures. A great fire burns within me, but no one stops to warm themselves at it, and passers-by only see a wisp of smoke. I feel a certain calm. There is safety in the midst of danger. 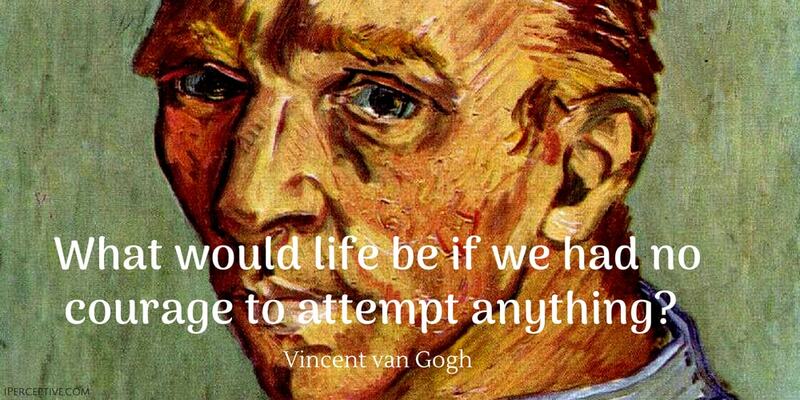 What would life be if we had no courage to attempt anything? It will be a hard pull for me; the tide rises high, almost to the lips and perhaps higher still, how can I know? But I shall fight my battle, and sell my life dearly, and try to win and get the best of it. 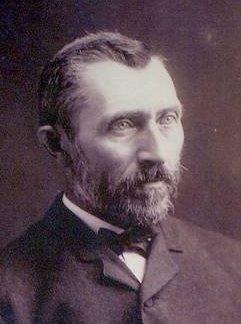 Vincent Willem van Gogh was a Dutch painter and artist. 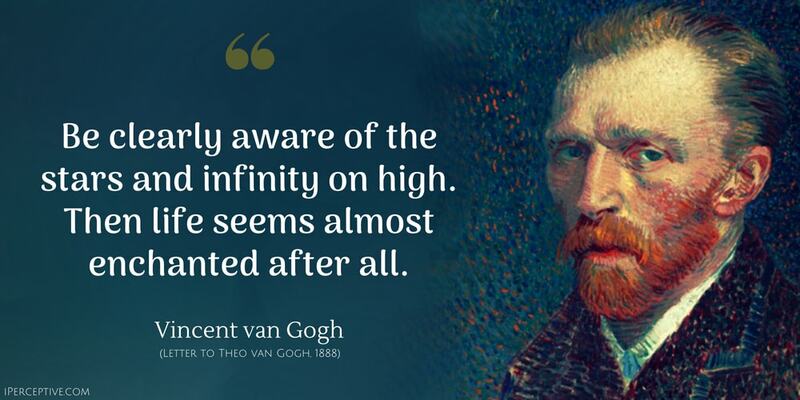 He is best known for his passion for painting and he has been highly influential on the art community since his death.